The URL in Xhin's signature: http://gtx0.com/ but there might be more for merging purposes? In any case I can't log into gtx0 anymore, with the password I created on gtx0 or my conworlds.fun password. Not going to the resolution thing (not sure what it is) to recover it, must be temporary, right? Need to post something on the up-down XOR game. Leo, try logging in as _Leo with your CWBB account. I haven't merged those accounts yet, so that'll turn back into "Leo" at some point. Chiarizio, same deal with you -- try logging into _chiarizio and _eldin raigmore with your CWBB password. This worked, thanks! I didn't post to the thread though because I got lost in the Starmaze link EN posted, which is shedding a new light onto the game. Yeah the starmaze website is a ridiculous rabbit hole. Everything is set up on my end. I'm doing a mock run today to make sure there aren't going to be any very obvious problems and then we should be ready to set an actual merge date. Location: Never anywhere but here! I'd leave that up to you! Whenever your tests are done and content from here is moved to GTXO, just let us know! EDIT: I notice there is some kind of post size limit. That could, especially in the Creative forum, stifle a bit. What is the nature of the limit? What's the issue you're getting specifically? I also feel what elemtilas just expressed. Hell, it could get in my way in World&Culture, WIP, Science, or Magic&SF. It could get in most people’s way in Art, and in Games. I think anything smaller than 24K is unreasonably constraining, at least for artwork. A lineprinter’s pages were 13.2 inches wide by 11 inches long. The characters could be printed on the lines at 12 characters per inch. (About 158 characters per line). The lines could be printed on the pages at 8 lines per inch. (88 lines per page). So a given page could contain 13,904 characters. Typically you’d be looking at two consecutive pages together. 27,808 is less than 24K = 24,576. I had trouble trying to copy pages I didn’t originally post, from conworlds.info to conworlds.com, then again from conworlds.com to conworlds.fun, because of the nginx error. Some of them had to be split into three or four parts! And one of the parts got lost. These were survey posts, or index posts, or table-of-contents -type posts. Overviews, etc., of what’s available on the CWBB. Can we avoid the nginx error? Sometimes some part of someone’s post on the old site, is invisible on the new site, unless (and except when) you’re trying to edit it. Can we avoid that this time? That one is totally unreadable. Hmm, I didn't realize it was an nginx error that was causing it. If so that would have affected this site as well. I'll look into it. At least GTX0 saves a copy of whatever you post in case there's an error that prevents you from posting it. That shouldn't be an issue. I spent a good bit of time making sure the formatting will transfer right. My point was just that it was a very long post. If this is indeed an nginx error though I'll figure it out and fix it. At the moment all the posts are locked and there's no way of looking at conworlds-branch posts specifically, however I've marked all the mock posts with a shiny earth icon. Let me know if anything (other than an errant [ url] tag, working on that) looks weird or broken. Also we should be ready for the actual merge whenever you guys are ready. Let me know what you think. Oh also you guys can login using your CWBB password to your actual name now without the underscore. EDIT: Quick question. I see that when I look at for example this post, clicking on a linked post leads me back here to CWBB. Will I be able to update the links to the relevant post in GTXO?? Posted: Sun Jan 27, 2019 8:42 am Post subject: It didn’t work. It used to work with the underscores. Now it won’t work with or without them. Just in case, I tried registering eldin raigmore. But I did read several posts, and clicking on links took me to the right places; except that clicking on CWBB links took me to conworlds.fun. Unless they tried to take me to conworlds.com or conworlds.info. Those didn’t work. Or they tried to take me to incatena.org or spinnwebe. Those didn’t work either. .... I've marked all the mock posts with a shiny earth icon. Those all seem to work just great 👍🏼! 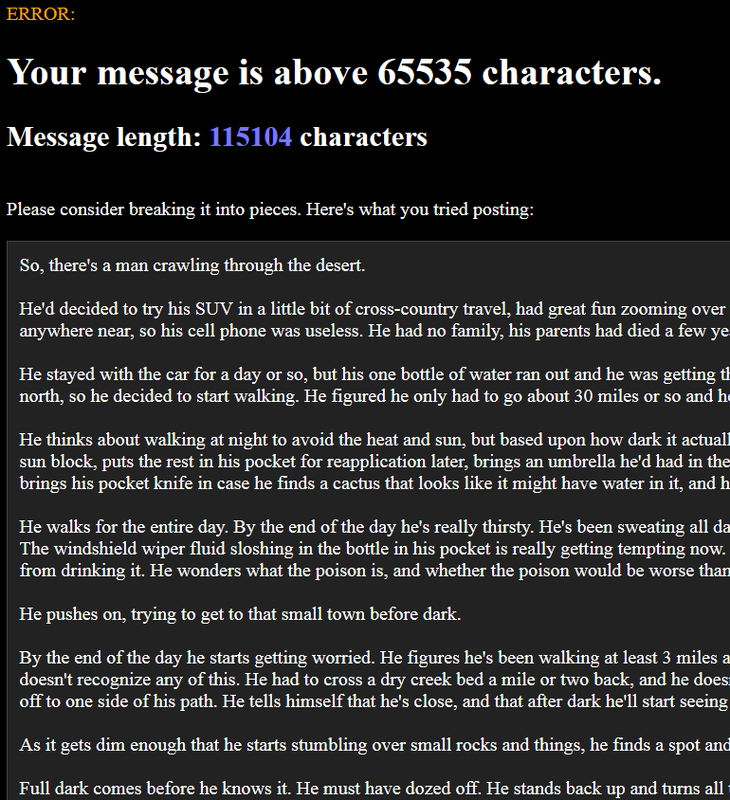 All right it looks like the actual message maximum length is 65535 characters. That should be more than enough for whatever you'd like to post, except perhaps some short stories longer than "Nate the Snake". If you hit an NGINX error instead then what you're posting is way way way too big, so big that it triggers the anti-dos protections. Might be better to host those kinds of files elsewhere. If I'm wrong and what you're posting is very definitely below 65535 then let me know with whatever the text is (maybe put it in a google doc or something) and I'll run some tests to try to fix the issue. Accounts should be fixed again. Try logging into "chiarizio" and "eldin raigmore" with your CWBB password. That's a more complicated issue, but it's fixable. There's no need to change the links yourself, I'll write a script that changes them all in one go. That's because those sites no longer exist -- zompist packed up the ZBB and moved it to Verduria. Nothing I can really do to fix those issues. Okay, was able to login as elemtilas; but I notice that I seem to be showing up as _elemtilas on GTXO. Is that normal or will the underscore somehow disappear? Would I be able to change my user name once i'm there (and have logged in with my current info)? Or would I have to make a new account to get a new username? Posted: Mon Jan 28, 2019 5:37 am Post subject: ANAICT everything is working now. as near as I can tell everything is working now. Neither eldin raigmore nor _eldin raigmore works. I am about to post my first reply to an original gtx0 member. What’s “merit”, how is it calculated, and when does it change? I also logged on as chiarizio, but it keeps telling me I’m _chiarizio. So I have the same questions elemtilas has. Can we sort posts by whatever? Forum, topic, post subject, author, date? Can we search the contents of the posts? which starts with a poll here on the CWBB, and I couldn’t find the poll anywhere. Yes, you can change your username. GTX0 also supports the idea of "altnames", where you can have multiple posting names linked to the same account. This can be useful if you want to post about your world speaking from the perspective of one of the conpeople there or something. This whole system will probably be scrapped and rebuilt at some point. I'd like to make the rankings portion of it reset every month or so (though you'll still keep "total" merit). * By user -- same as "author search". If you're logged in, clicking "mine" will fill it in with your username. * Date -- here you can put in a specific date, and specify whether you want to search for posts after that date or before it. * Title looks like -- the same as "post subject" search. * Section -- This allows you to search individual forums on the CWBB pre-merge. It will also show "topics" elsewhere on GTX0 from older sorting systems. * Sort -- This lets you sort the posts you search for in ascending or descending order. On GTX0 by default, the view of all forums is based on when the topic was created, with more newly created topics appearing first (after stickies of course). By changing this to "Hottest" you can get more of a "last replied-to" view like appears here and elsewhere. I believe there's an option in your user CP that allows you to do this automatically as well. By changing it to "Replies", you instead get a list of replies sorted by newest replies first. This is a great way to look at new replies to a forum "at a glance". There's also a "Replies: full text" option which doesn't cut off replies at a certain character limit. Up at the top of the site you'll see three links below the blocky forum links called "Newest Posts" , "Replies" and "Hottest". These do the same functions, except they aggregate the entirety of the site. I'm working on importing polls. * All the stuff I've transferred over will be deleted before the merge. After the merge there will be a fresh copy of all the posts here. * The formatting in the database is really crazy. I have some filters in place to make the posts show correctly but they haven't been attached to post editing yet. Posted: Mon Jan 28, 2019 8:11 pm Post subject: All of that works (great! ), but two questions. OK, both IDs work fine without the underscores. And everything else you mentioned works too, with the exception of the polls, which you are already working on. Or maybe one other thing, too. I have no idea what “section” my posts will be in. I couldn’t look up my “ is the future in front or behind?” post by section. Having found it by date, I still couldn’t figure out what section it’s in. In general, though, I’m pleased! I don’t need to wait on any remaining problems I know about! I’m ready to go if everyone else is. I may still need some tutelage right after the merge for a while, though. I don’t like the length restrictions in the “merit” system. Aside from my own habits, I think it would penalize anyone who posts a complete story. And elemtilas and Foolster and bloodb4roses and even Xhin and Leo have done that, to my considerable enjoyment. Maybe you could double all the length restrictions in the story part? And quadruple them in the art part? A good short story would probably be a thousand words long. English words actually average about 7 characters in mean length; but it’s customary to pretend that average should be 5 characters. So, 5000 characters for a short story, 10000 for a novella, 20000 for a novelette, or some such thing? Anything longer should probably be divided into chapters. As for me and my habits; maybe I should attempt to break up my long posts more; or maybe I should just never care about the “merit” thing. But, really, I don’t see why I shouldn’t post 8K posts whenever I have that much to say; and I don’t think 24K is unreasonably long if it’s not too frequent. If I type on an 8.5 inch by 11 inch piece of typing paper, leaving quarter-inch margins at the left and right, and half-inch margins at the top and bottom, and use a pica monotype font of ten characters per inch horizontally and six lines per inch vertically, I’ll type 80*60=4800 characters. Call it 4K = 4096, and subtract one for 4095. I think it’s reasonable to ask contributors to paginate what they say if it’s over 4095 characters, but not to force them to do so if it’s shorter. Nor to penalize them for posting a whole page or less. If they post more than two pages, likely many won’t read every page. So you might start dinging them whenever they post more than four pages. A 3*5 card would hold about 18*50 = 900 characters. About the size of a card in a library card catalog. Very minimal. A 4*6 card would hold about 24*60 = 1440 characters. About the size of a recipe card in a recipe box. Quite concise and compressed. A 5*7 card would hold about 30*70 = 2100 characters. I don’t really know what’s that big. A 7*9 page would hold about 70*54 = 3780 characters. If you had an 8*10 page but you were required to leave half-inch margins all the way around, say, because you were submitting a journal article, you could put this many on a page. Hardly prolix; very disciplined. 8 * 10.5 could hold 80 * 63 = 5040 characters. 8.5 * 11 could hold 85 * 66 = 5610 characters. Reasonable one-page short-short stories, I guess, with big type for the nearsighted. And that’s all assuming it’s ten-point type; ten letters per inch horizontally, and six lines per inch vertically. On a landscape-oriented 3 * 5 card you could have 24 lines of 60 characters each, for 1440 characters. On a landscape-oriented 4 * 6 card you could have 32 lines of 72 characters each, for 2304 characters. A portrait-oriented 7 * 9 page would have 72 lines at 84 characters each, for 6048 characters. Portrait-oriented 8 * 10.5 would be 84 lines times 96 characters per line, about 8040 characters. Portrait-oriented 8.5 * 11 would be 88 lines times 102 characters per line, about 8976 characters. I don’t see why anything that short would need to be sectioned. The biggest one is still just one page. would make it less comprehensible, rather than more. over 24K be regarded as large. The original merit restrictions were somewhat arbitrary and also based on the needs of a very different community (one where long posts serve to kill conversation rather than generate it). Are you going to set a minimum length of, say, 900 chars? Or 512. Or 1024? Or 768? Or, if it’s a reply, original content can’t be less than 25% as long as quoted material? Not making a recommendation. Nor warning against. Just saying what I’ve seen elsewhere! I couldn’t login to gtx0 as chiarizio last night; but I could as _chiarizio. EDIT: This morning Both chiarizio and eldin raigmore work. Neither _chiarizio nor _eldin raigmore work. That’s how it’s supposed to be, right? The only weird thing is that most of my posts as eldin raigmore seem to have been made on December 31st of 1969 CE. I don’t think I was even aware of this online community then. In fact that’s around the time I first read M’Intosh’s novel “Time Out of Mind” and encountered its hero “Eldin Raigmore”. My friend Chiarizio was still alive then. I often wondered at the origin stories for your names! * Polls have been fixed. * The 1969 posts glitch has been fixed, which also means that the "Hottest" view of posts (the way the CWBB handles it by default) works correctly again. Yes. Everything should be working the right way now. Are we ready to merge for real? I am. Others must speak for themselves. BTW what about our PMs? I can transfer the PM's too, they should be much much easier than anything else I've had to do so far. I already have something I want to post. Should I log on now to gtx0 as chiarizio and post it Ona a new thread? Or wait until after the merge? Just to follow up on a previous question: were you able to sort out a way to update CWBB posts that link to other CWBB posts? In other words, so that the newly transferred GTX0 posts will now link to the appropriate GTX0 posts? You could post it now or then, doesn't matter. Doesn't matter which website you put it either. Not yet, but that'll be one of the things I fix post-merge (along with PM's and editing issues). See you guys on the other side! So long CWBB and thanks for all the fish! Gbye, CWBB, it’s been a lot of fun! Many fond memories, and I’m sure I’ll think of you frequently for a long while; and probably think of you occasionally until I succumb to Alzheimer’s. Ditto. Thank you Xhin for the wizardry!